Health savings accounts allow you to sock money away on a pre-tax basis, grow it free of taxes and withdraw your savings tax free if you’re using it for qualified medical expenses. All-in, average total expense ratios can approach and surpass 1 percent at some of the largest HSA providers, according to Morningstar. Plan providers can add on maintenance fees, investment fees and more. In the world of health savings accounts — a tax-advantaged way to save for medical needs — not all offerings are created equal. HSAs, which pair with high-deductible health insurance plans, offer savers a way to put away money on a tax-deductible or pre-tax basis. Contributions then grow on a tax-free basis, and account holders can take distributions to cover qualified medical expenses. Though the tax benefits of HSAs are universal, the accounts themselves will vary from one provider to the next, particularly when it comes to the fees investors must pay. “The thing with HSAs is that there are several fees to take into consideration,” said Leo Acheson, associate director of multiasset and alternative strategies at Morningstar. This is especially true for investors who want to shop HSA providers after parting with an employer. “A lot of the banks I’ve seen charge the highest platform fees — $50 or $100 a year to have the account and they’re using A-share mutual funds [which charge an upfront fee to investors at purchase],” said Stephen Jordan, a certified financial planner with Cyr|Woertz Financial Group in Peoria, Ill.
“That’s never a good option for a small amount of money when you’re trying to create growth; you’re throwing money out the window,” he said. Here’s what you need to know about the different fees in your HSA. Your HSA will be assessed based on two components: Fees taken out by the provider and investment expenses, according to Devenir, an HSA consultancy. Those “provider fees” include account maintenance costs, which may be assessed on a monthly basis and could be waived if an account holder’s balance crosses a particular threshold, which can range from $1,000 to $5,000, Morningstar found. These expenses can sap the account if a saver merely stashes the HSA in the provider’s checking account and uses it concurrently for medical expenses, instead of allowing it to accumulate. “It’s fairly common to have low balances, so fees do play a role,” said Patrick Amey, a certified financial planner at KHC Wealth Management in Overland Park, Kansas. “We’re looking for an account where the fees are reasonable and you get good value,” he said. A saver who has contributed $2,000 for the year, spends half of that balance on qualified medical costs and pays $4.50 each month for maintenance fees will have lost more than 5 percent of his year-end balance due to these monthly fees, according to Morningstar. Savers who are intent on storing their HSA funds for long-term use — perhaps holding off on spending the money until they’ve retired — need to consider the investment fee providers charge as well as the cost of the underlying funds they select. 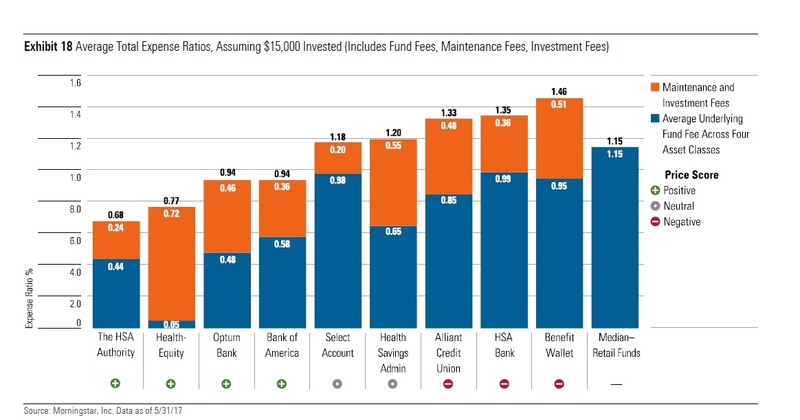 See below for Morningstar’s breakdown of total expense ratios based on an investment of $15,000. Note: SelectAccount is now known as Further. How providers levy these expenses will vary. “Some plans have no dollar-based investment fee, but they’re using A-share mutual funds in their plan and that’s how they get paid,” said Acheson of Morningstar. “Others have cheap funds in their plans — such as institutional share classes — but they layer on a dollar-based investment fee,” he said. If you’re thinking of moving your HSA to a different provider, here are a few things to consider. How will you use the account? If you’re planning on withdrawing from your HSA regularly to cover near-term medical costs, keep a close eye on maintenance fees. High costs due to failure to attain a certain balance threshold can take a bite out of your savings. Will you invest long-term? If you’re planning on saving your HSA for the long-term, pay close attention to your provider’s fund lineup and expenses. High fund expenses sap your returns over time. What kind of line-up are you seeking? A well-rounded fund menu with offerings in all core asset classes can be hard to find. “If you offer 500 funds, you’re not helping someone make a decision,” said Acheson of Morningstar. The sweet spot for investment options is between 18 and 24 funds, he said.